UPDATE 8/7/15: Since I posted, I have received feedback from several better birders than myself, agreeing with AMERICAN GOLDEN-PLOVER for the above bird. Then this afternoon I saw that my report to eBird had been confirmed by the reviewer. 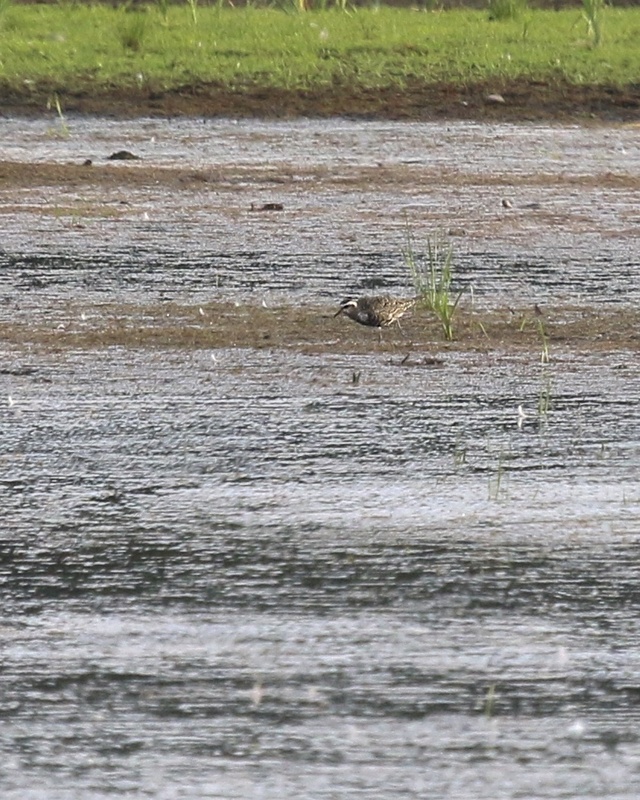 American Golden-Plover it is! QUICK POST: Karen Miller and I walked the Liberty Loop this evening and had a good showing of shorebirds. The west leg of the loop had the first decent collection of shorebirds that I’ve seen there this season: 1 Killdeer, 6 Solitary Sandpipers, 1 Spotted Sandpiper, 4 Least Sandpipers, and 2 Lesser Yellowlegs. For those who care, all these birds were in Sussex County (they’re edging towards Orange!). 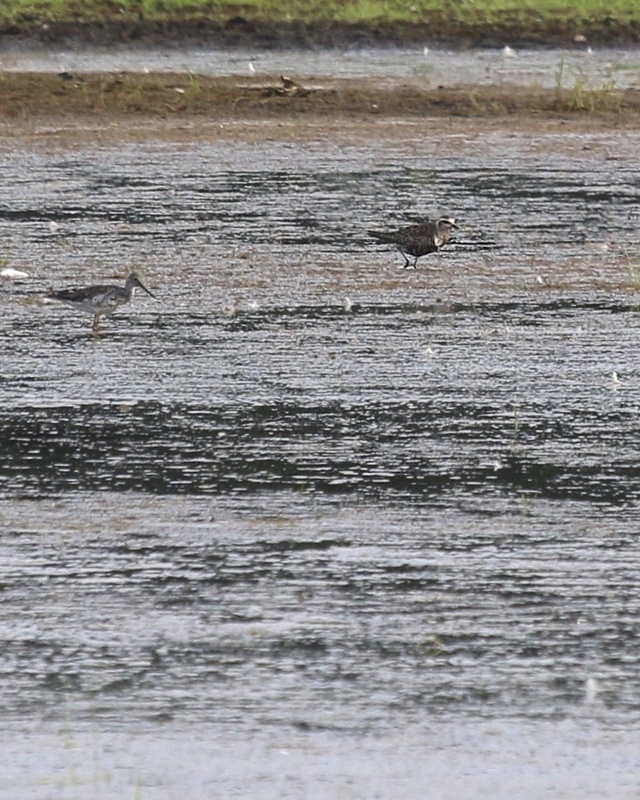 Most of the shorebird action, however, was still in the back pond. The highlight was a distant look at a plover that I am thinking was an American Golden-Plover (rather than Black-bellied). Black wing pits in flight are diagnostic for BBPL; I saw this bird take two short flights and did not notice black wing pits. The bird was quite distant and the flights brief, so I am not 100% about this (I wish I was!). One of the reasons I think I am doubting this ID is that the bird appeared to be on the large side for an AMGP My impression of the bill size in the field is that it was small enough for AMGP, but that’s a tough call for me to make, especially at the distance we were viewing the bird. Please comment if you have any thoughts about this bird or if anyone gets out to see it, I would be curious as to what they think.